A parabolic dish assembly designed to concentrate the suns energy on a focal point to create heat. The standard configuration includes a receptacle for monitoring water temperature increase due to the heat created as a demonstration activity. This device demonstrates how a heat source can generate a standing wave in a gas. The oscillation can be used in this case to drive a piston and flywheel, which is in turn connected to a small generator. The power can be monitored via the 2 mm connection points. This unit can also be located in the solar furnace assembly which can be used to replace the burner as a heat source to demonstrate a fully sustainable energy source. 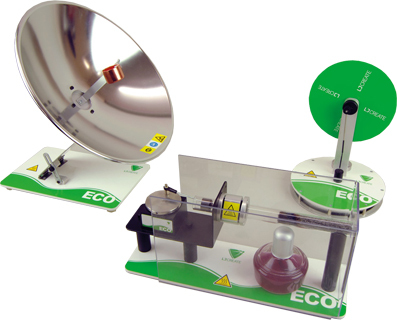 This bench top model demonstrates how cyclic compression of a gas can be used to convert heat energy into mechanical energy. The unit includes a metal bowl which is filled with hot water to provide the heat source. This resource can also be used in conjunction with Optional Cloud-based Software, which offers online practical tasks as well as interactive theory presentations, investigations, and assessments, which link directly to the practical activities carried out using this resource.